The loss of capacity in common cars during winter, applies to electric cars as well who lose the capacity of their rechargeable lithium-ion batteries when the temperature is very low. Researchers have now found a way to design a battery system with a hard-carbon and powerful lithium-rich cat ode, all based on an experiment named lithiation. At low temperature, the hard-carbon is a good option for the future of battery technology as it is low cost anode material and show kinetics of lithium-ions. During the charging and discharging process of a battery cell, lithium ions migrate from the cathode through an electrolyte to the anode and repeat the process in the inverse way. The anodic material which contains prestored lithium can be changed by the incoming volume of lithium-ions and ensure longer cell life and control a faster charge/discharge process. The prelithiated hard-carbon has been proven as a robust material in lithium-ion capacitors. Scientists however are looking for ways to make the prelithiation process less complicated and cheaper. They introduces a lithium-rich vanadium phosphate electrode instead of an extra lithium electrode fot lithiation and normal battery operation. The lithium-ions are lost from the cathode to the anode in the initial process but the are intercalated and properly stored. 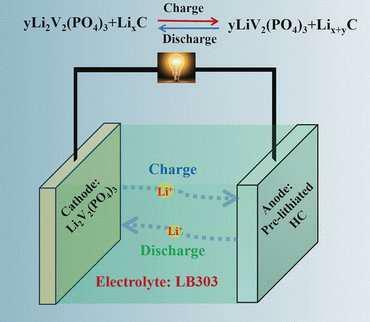 The combination of lithium-reduced vanadium phosphate cathose and the prelithiated hard-carbon anode helps form a working lithium ion battery system. With this type of battery system, scientists observe a high energy density characteristics of conventional lithium-ion batteries by exhibiting a supercapacitor-like high power and extended life cycle. It’s also been observed that the system can keep up to two-thirds of its capacity at an extremely low temperature, which is high compared to conventional lithium batteries that can only retain one-tenth of their capacity in the same low temperature environment. With the electrolyte still losing conductivity in extremely low temperatures, scientists are hoping solving the flaw can help design and build an incredible battery system able to endure extremely cold winter conditions.